The sugar peas are nearly done. The vines have mostly collapsed. Since I neglected to trellis them, it was hard to see a lot of the peas that got buried in the foliage, which means we ate some peas that should have been picked sooner. Mature sugar snap peas are still edible, but they're not as tender and sweet as the younger peas. Orach (Atriplex hortensis) has been cultivated for hundreds of years, and it's certainly a beautiful plant. Also known as Mountain Spinach, I think it's one of the few leafy red vegetables that holds its color when cooked, as you can see from the photo above. Nonetheless, I don't see myself growing it again. Why not? The seeds germinate unpredictably. The seedlings are maddeningly temperamental -- wilting, recovering, wilting again - they're like Victorian ladies having fainting spells! The plants did eventually get a few feet high, but there are not that many leaves per plant (at least not on the ones in my garden) and the leaves are not particularly large, and besides the taste was rather bland. So all in all, besides the appearance, there's not much I can say to recommend orach. It might be a bit more heat-tolerant than spinach, but I'd rather use the garden space in the future either for true spinach (individual plants yielded far more leaves) or lettuce, which is still hanging touch in my garden thus far in late May and has yielded many, many salads. Of course, it's always fun to grow something new and unusual, but there are many other rare leafy greens to try growing besides orach -- such as tatsoi, arugula, mibuna, mizuna, etc. etc. 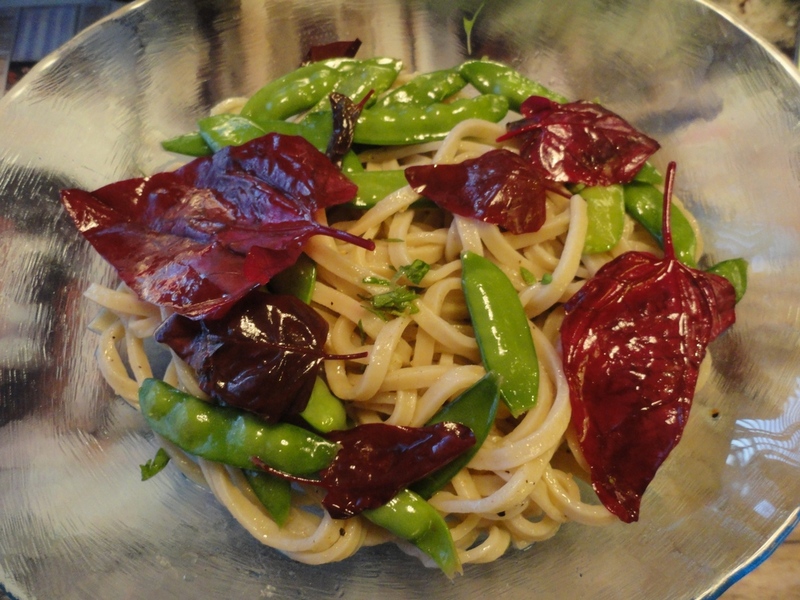 We ate some of the peas and orach on their own as a side dish and then tossed some in with this pasta. Right before serving, we sprinkled in some fresh herbs - Italian oregano and a bit of baby Genovese basil sown from seed.